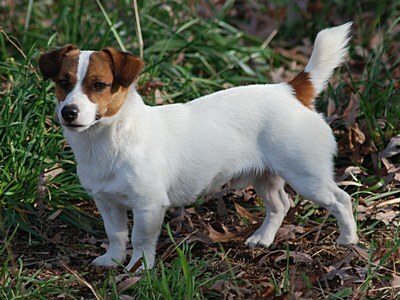 This Jack Russell never meets a stranger. He loves to please. He has all of the finest qualities that his Great Grandfather brought into the Fox Fire Jacks blood lines. And we know that these qualities will pass on to his puppies. "Sargeant Waldo at Fox Fire"
9' Tall & 12 lbs. His Mom is "Fox Fire's Oreo Cookie"
His Dad is "Rocky Top at Fox Fire"
He is super calm, gental, and sweet as can be!!! I am not prejudice!!! But I will tell you I have some of the greatest male jacks in the would!!! This gorgeous little boy will soon be a Stud here at "Fox Fire Jacks". This little boy got the very best from his Mom & Dad. Calm, Gentle, Sweet, Easy going, Smart, and he has the looks to go with it!!! His Mom is "Fox Fire's Buttons"
His Dad is "Noah at Fox Fire"